John Erickson Museum of Art, Deitch Projects Art Parade, 2007. JEMA participating in Deitch Projects’ Art Parade, New York City, 2007: (left to right) Buki Bodunrin, Dan Stepp, Cassandra Ferland, and Sean Miller. Photo by David Rainey. JEMA exhibition show cards advertising exhibitions by John Kieltyka, Arnold Mesches, Saya Moriyasu, and Sean Taylor. Photo by Sean Miller. Cassandra Ferland and Buki Bodunrin offer exhibition tours, hand out JEMA outreach materials, and distribute show cards and carry exhibitions by John Kieltyka and Saya Moriyasu. Gallery view: JEMA’s new gallery space constructed for Oliver Herring’s Areas for Action at JEMA, 2014. Pictured here hours before the performance on May 9th, 2014. Photo by Sean Miller. Michael Baumen and others participate in Areas for Action at JEMA, May 9th, 2014, at Bob Rauschenberg Gallery, Fort Myers, Florida. Photos by Kate Helms. Michael Baumen, Josué Charles, and others participate in Areas for Action at JEMA, May 9th, 2014, at Bob Rauschenberg Gallery, Fort Myers, Florida. Photos by Kate Helms. High Art opens in Miami prior to being loaded on to the banner plane advertising Sergio Vega’s exhibition. As advertised, Sergio Vega and Sean Miller at the two-minute opening for High Art at the Art Basel Miami Beach V.I.P Lounge, December 4th, 2004. Photo by Sean Miller. Sergio Vega and Sean Miller at the two-minute opening for High Art at the Art Basel Miami Beach V.I.P Lounge, December 4th, 2004. Photo by Bethany Taylor. JEMA Annex pictured collecting dust as it settles on them at the Samuel P. Harn Museum of Art. JEMA Annex Consultants includ­ed: Charisse Calaquian, Leah Floyd, Ladis Pietros, Kelly Rogers, and Matthew Whitehead. Photo by Sean Miller. Photo from film: How to Start Your Own Country, taken May 21st, 2009 on Honeymoon Island, near Tampa, off the mainland coast of Florida. 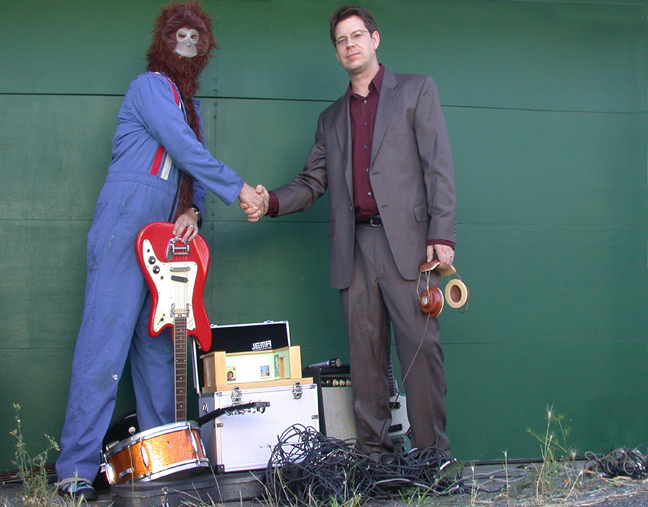 Photo by Gregory Green and Jody Shapiro. Ben Patterson’s Paper Piece at JEMA, Raccolte Frugone Museum, Italy, 2010. Ben Patterson’s Paper Piece at JEMA, 2010. Ben Patterson, Sean Miller, and JEMA’s Annex Consultants: Elena Aromando, Mauro Panichella, Cristina Peruzzi, Emanuela Tortello, and Giulia Vasta. Photo by Bethany Taylor. Sean Miller with Ben Patterson and his JEMA exhibition Bollywood Love: Object of Desire, Macon, Georgia, November 11th, 2010. 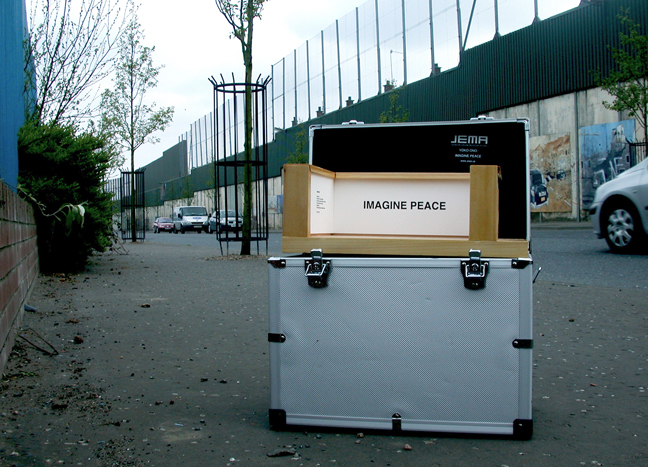 Yoko Ono’s Imagine Peace opens at the Peace Walls, Belfast, Northern Ireland, 2008. Photos Sean Miller. JEMA opens at National Museum of Ireland for Sean Taylor’s 100 Paces. JEMA with Irish Defense Forces for the opening of 100 Paces at the National Museum of Ireland in Dublin, 2007. Photo by Sean Miller. Performance and pirate radio broadcast: Museum Nights with the Primate 5 at the John Erickson Museum of Art, Seattle, Washington, Photos by Sean Miller. 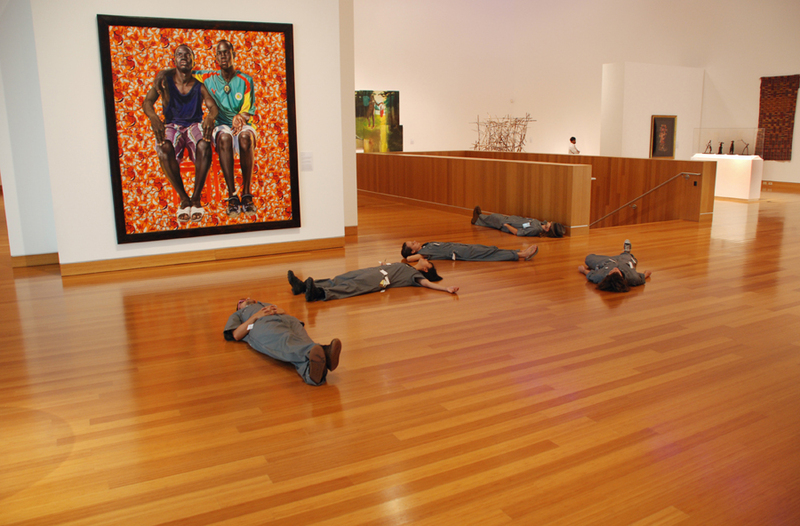 Exhibition view: Eleven: John Erickson Museum of Art 10-Year Retrospective, at the Harn Museum. Photo by Annemarie Furlong. Andrea Robbins and Max Becher’s JEMA exhibition Bavarian By Law is in Place, Leavenworth, Washington. 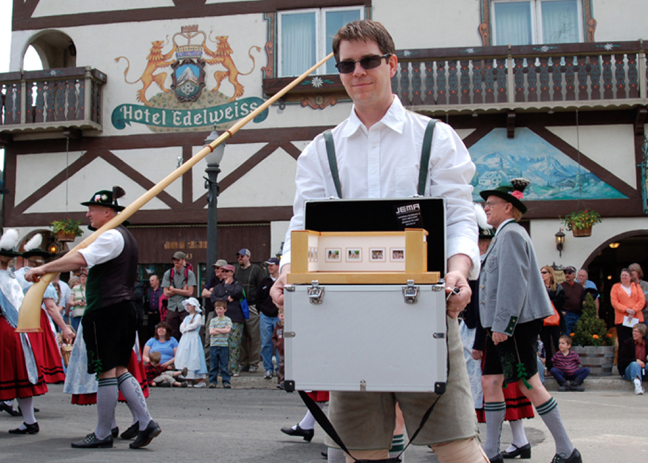 On May 11th, 2008 JEMA Director Sean Miller, proudly transported the Andrea Robbins and Max Becher photographic exhibition, Bavarian By Law is in Place, to the 2008 Maifest Celebration and Parade in Leavenworth, Washington. Photos by Sean Miller and Sergio Vega. JEMA in Cottage Industry at Contemporary Museum, Baltimore. Cottage Industry exhibition at Contemporary Museum Baltimore with Lisa Anne Aurbach, City Reliquary, Fritz Haeg, Christine Hill, Irene Hofmann, and John Erickson Museum of Art. In October 2012, Brendan Jamison, on behalf of the John Erickson Museum of Art (JEMA), delivered and placed a small land use action sign near the perimeter fence of the Teufelsberg Spy Station. Photo Brendan Jamison. Sean Miller and Brendan Jamison at Teufelsberg Spy Station with JEMA’s new facility, preparing to break ground on July 26th, 2013, Berlin, Germany. Photo by Sean Miller.